Move over, pumpkin, there is a new veggie in town, ready to land in all things sweet and savory: the Sweet Potato. Deep orange in color, velvety soft when roasted and naturally sweet, this root vegetable pairs nicely in your quick breads and muffins to add a nutritious dose to your afternoon snack or take-away breakfast. I’ve paired the sweet potato here with applesauce, Indian sugar, whole wheat flour and walnuts for a satisfying and healthy snack that you can take with you anywhere, serve to hungry kids as an afternoon snack, or offer up to company along with a cup of coffee or tea. 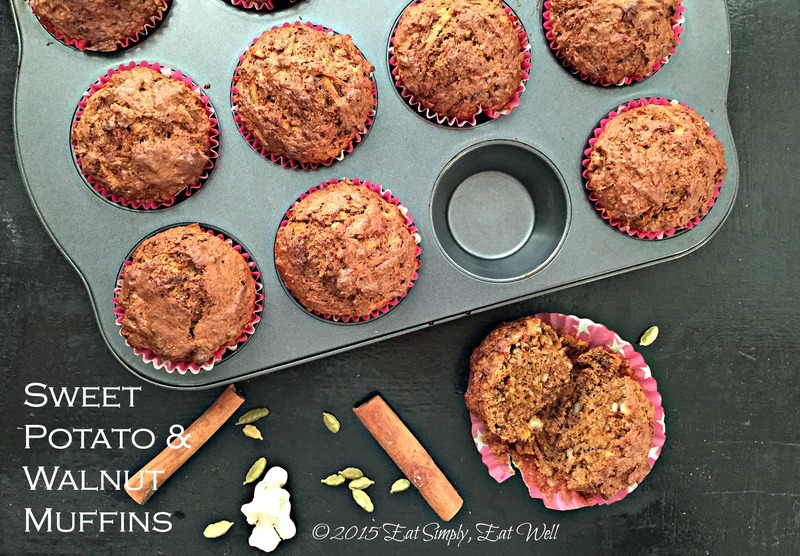 Fragrant with warm spices: cinnamon, cardamom, ginger and clove, this is a muffin that lets you know Fall is firmly and clearly here, right in front of you. Pack a few of these in your bag, along with a thermos filled with your hot beverage of choice, and head outside to capture the last rays of sunshine as they beam through the colorful autumn leaves overhead, and onto the piles of fallen color crunching beneath your feet on the trails below. This is a magical time of year, right now, when the colors are at their peak and time seems suspended for just a brief, fleeting moment. Go on – make these muffins and get outside! Eating sweet potatoes with good quality oil helps your body to absorb the vitamin A, so don’t be afraid of the olive oil in this recipe, or of good fats in general. High quality fats do the body good! In a medium mixing bowl, combine the eggs, sugar, oil, applesauce, water and vanilla. Whisk to combine. Add the grated sweet potato and stir to combine. In a separate, large mixing bowl, combine the flour, baking soda, baking powder, salt and spices. Whisk to combine. Add the wet ingredients and stir until the flour is mixed in. Add the walnuts and stir to combine. Divide the mixture evenly between 12 lined muffin cups. Bake 25-30 minutes, or until puffed, golden brown, and a toothpick or thin knife inserted into the center comes out clean. Very promising recipe, thank you! I’ll test these and pamper my (almost adult) kids over the weekend. I noticed that ground ginger is mentioned twice. Hi Jaana! Thanks for the feedback and for noting the error in the text! Fixed now. 🙂 I put half the batch into the freezer to keep them “fresh” for longer, and have been enjoying them with afternoon tea over the last couple of days. I hope you enjoy them!